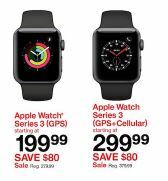 Find a great deal on an Apple Watch during Black Friday 2019 here at Funtober. 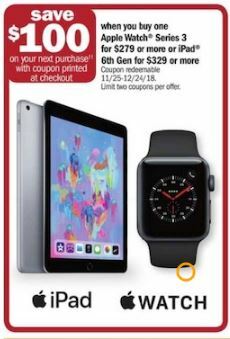 We will review print and online ads for Black Friday and Cyber Monday 2019 and post the best discounts on the Apple Watch 4, Apple Watch 3, Series 2 and older versions of the popular Apple product. The Apple Watch has historically been one of the hottest Christmas gifts and 2019 should be no exception. 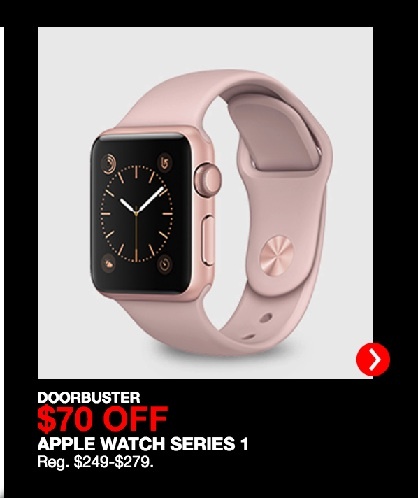 When the Apple Watch launched in 2015, it was an in demand item. The Series 2 was nearly impossible to find before Christmas 2016. And we expect that this trend will continue. 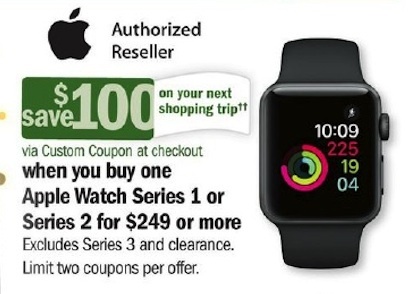 So if you have your heart set on giving out the Series 4, better secure it early! March 2019 Update: They are just beginning to talk about the features that the next generation Apple Watch might have. 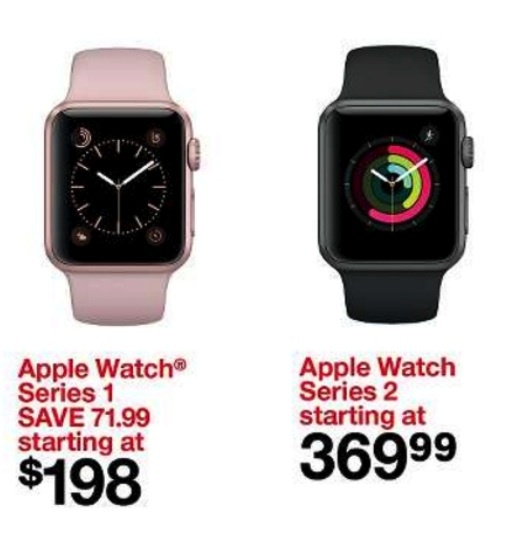 It isn’t clear yet whether the Apple Watch 5 will be ready for Black Friday 2019 or not. Even if it is released, We don’t know yet whether there will be any big deals on it. We will be following the ads closely to see what they are doing for the kickoff to the Christmas shopping season with this hot product series though. 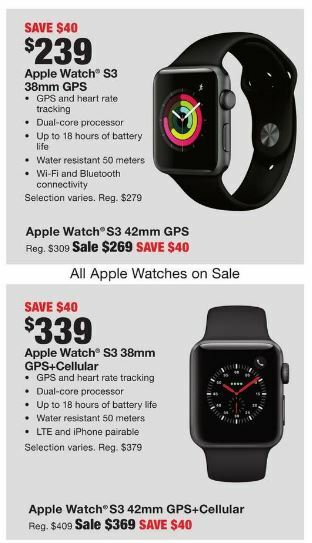 Hopefully there will be some great Black Friday deals on the Apple Watch 4 since it will have been out for an entire year by this Thanksgiving. The Series 3 was a top performer in Consumer Reports testing. It retails for $499 for the 42mm stainless steel case with GPS and Cellular. It earned high marks for step counting and heart-rate tracking. It also scored well on scratch resistance. The big difference between the Series 3 and the Series 2 is that some versions allow users to receive calls and text messages without having to carry your cell phone. It also contains a few other upgrades, including a faster processor. The Series 3 38mm Aluminum Case with GPS and Cellular retails for $399. Without cellular, it retails for $329. The LTE connection currently costs $10 a month on major carriers in addition to your iPhone plan. If you are within range of your iPhone, the Watch connects via Bluetooth. If you are not, then it uses the LTE communication. The battery life is approximately one hour of talk time via LTE, three hours via the bluetooth connection, and around 18 hours with moderate use. We will post them here when Black Friday and Cyber Monday deals are available. We still have a few weeks before stores start releasing their ads. So we hope that you will return in November 2019 after we have posted the best savings here. It’s still too early to say right now! The original Apple Watch was announced in September 2014 and released in April 2015. The second generation of Apple Watch including the Series 2 and the Series 1 (identical to the original with a S1P chip) were released in September 2016. 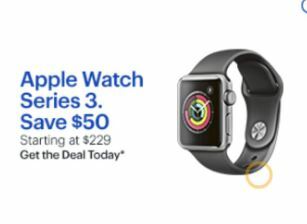 The Apple Watch Series 3 was released in September 2017.